(IsraelNN.com) The tabloid Aftonbladet, one of Sweden’s most popular newspapers, published a report Tuesday that claimed IDF soldiers execute Arabs in Judea and Samaria, harvest their organs and sell them. The report carried a photograph that purportedly shows the body of a victim of such an execution, with a large scar running from his chin to his abdomen. It notes the IDF’s explanation that the scar is from an autopsy which is routinely performed on people who are killed in fighting – but seems not to give it much credit and prefers a completely unsubstantiated claim by Arabs regarding forced organ harvesting. 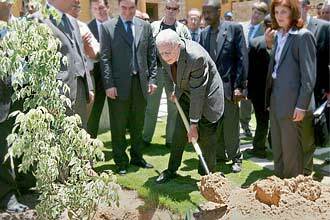 Jimmy Carter diz que palestinos de Gaza são tratados "como animais"
"Nunca antes na história houve uma ampla comunidade como esta sendo atacada brutalmente por bombas e mísseis para depois ser privada de reparos", ele disse. "Preciso conter as lágrimas quando vejo a destruição deliberada que foi lançada contra esse povo", acrescentou. "Essa escola foi destruída deliberadamente por bombas de F16 fabricados em meu país", admitiu ainda.